The 1957 Turnpike Cruiser was a direct descendant of a 1956 concept car taken to motor shows. The Turnpike Cruiser was sold as a two-door coupe and convertible. Both had a 6,031 cc V-8 engine of 294 bhp at 4,600 rpm and Merc-O-Matic automatic transmission. When the Turnpike Cruiser won the 1957 Indianapolis 500 the factory produced 1,265 replicas of the Indy car. 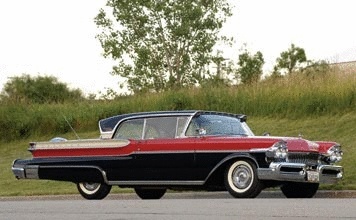 The Cruiser was taken off the market in 1958 to be replaced by the cheaper Medalist.